End-of-Days Watch: P&G Café Moving, Getting "Refined"
UWS icon the P&G Cafe has lost its lease -- but will it lose its divey charm in its new spot? Who can keep up with the soap opera swirling around the P&G Café? Old-New York buffs, neon connoisseurs and career alcoholics know the P&G as an iconic dive that's been parked on the corner of 73rd and Amsterdam since 1942. (And even if you're none of the above, you've probably seen the bar's distinctive neon signage on Seinfeld.) 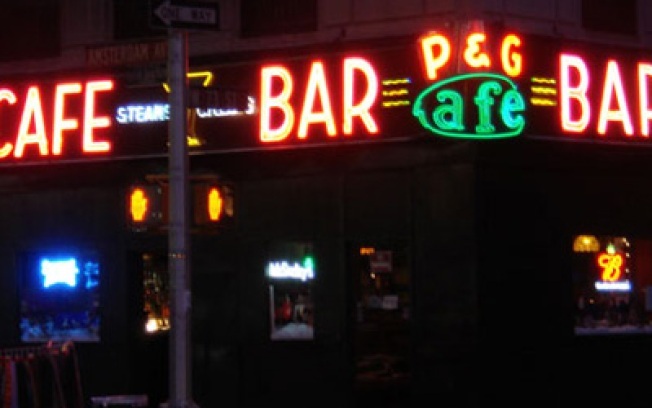 As the obnoxious trend of $12 'tinis in shiny lounges infected Gotham, the P&G held strong, with its $4 points of Bass, wood paneling, and crusty self-serve coffeepot where inebriated souls could pour themselves a cup of joe -- to help them stay awake longer so they could drink more. Naturally, a place this awesome was sure to close and become something stupid, like a branch of a bank that has another branch a block away, right? Right. But P&G wouldn't go slowly into the good night. We first heard about the bar's imminent shuttering from MUG in September 2006. A petition from regulars racked up nearly 4,500 signatures, but the landlord -- cleverly realizing that signatures have no cash value -- started in with a series of tricks to push out the boozy tenant, including ripping out the bar's walls in a supposed "building resurfacing" reno in May 2007. In January of '08, scaffolding went up for reasons unclear, as reported by Lost City (another landlord shove-out gambit, it was assumed). Then everyone went into mourning when December 31st 2008 was circulated as the bar's last day in existence. But wait! There's more! Now, two-plus years after we first heard about its demise, comes news that P&G owner Steve Chahalishas inked a deal to move the institution to 78th and Columbus. While we're glad it's not outright closing, we're a little scared at the details: The New York Observer reports that the space, formerly occupied by the Evelyn Lounge, is four times the size of the current P&G, and will be "more refined," with Chahalis angling to "do it up like a man's study in deep burgundy and walnut." Also, it will have a kitchen -- unlike the current P&G which, despite the sign hawking steaks & chops, caps its food offerings at wee bags of Cheetos dangling behind the bar. What will they serve? "Teriyaki garlic-saffron-rubbed burgers." Oh, sweet Jesus. And finally, what of that beautiful neon sign? Chahalis "steadfastly refused to comment" on its fate. Stay tuned.